Small drug refrigerator; lt 28; temperature 5°C with display; 3 transparent drawers; memory of max and min temperature; open door alarm; internal led light; ventilated and extremely quiet; door lock. 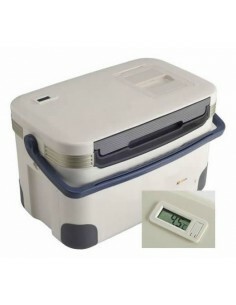 Small drug refrigerator; lt 53; temperature 5°C with display; 3 transparent drawers; memory of max and min temperature; open door alarm; internal led light; ventilated and extremely quiet; door lock. Refrigerator for universal use; 141 l; adjustable temperature from 2°C to 15°C; 3 shelves; alarms: under and over temperature, door open and power failure; lockable door. Suggested use: universal. 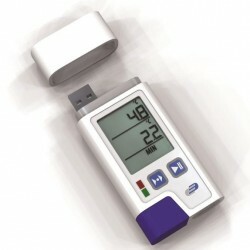 Mini data logger set (temperature recorder) Datapoint 16 (log 200), usable even without software; automatic creation of pdf files; USB interface for PC data management, battery life 4 years, 150,000 memory data. Refrigerator of 141 l; adjustable temperature from 2°C to 15°C; glass door; 3 shelves; alarms: under and over temperature, door open and power failure; lockable door. Suggested use: universal. High quality Jointlab lab freezer with 160 l; variable temperature from -10 to -30°C; datalogger with usb out to collect datas. All kinds of alarms. For the transport of large quantities of drugs. Holds for 36 hours the medicines between 2 and 8° C with an external temperature of 24 ° C. Useful space of 9 x 18 x 14cm (W x D x H). 2 standard eutectic plates. Refrigerator of 434 l; adjustable temperature from 2°C to 15°C; 5 shelves; alarms: over temperature, door open; lockable door. Suggested use: universal. High quality Jointlab refrigerator with two compartments with positive temperatures; 150 L net x 2 (total 300 liters); shelves 3 + 3; variable temperatures 1 ... 10°C x 2; datalogger with usb out to collect datas. All kinds of alarms. Refrigerator of 141 l; adjustable temperature from 2°C to 15°C; glass door; 3 shelves and 2 drawers with dividers; alarms: under and over temperature, door open and power failure; lockable door. Suggested use: universal. Comes with a datalogger. Container for drugs, blood bags, vaccines biological material. 28l. Keep for 33 hours the temperature between 2 and 8°C at 43°C ambient temperature! With 14 packs of Soft Gel. With digital display and internal bag. Frigolab.it is a site specialized in the sale of cold. In the laboratory, in pharmacies, in industry, for free time. Portable refrigerators, laboratory, pharmacy, ice makers and much more; you will find all the cold of the world in frigolab.eu! 11.00am - 01.00pm or call for a meeting. Remember we are not a shop, but a company/factory. Ring in Via Prestinari 2 or in Via Michetti 4 p.01 at Jointlab Srl.